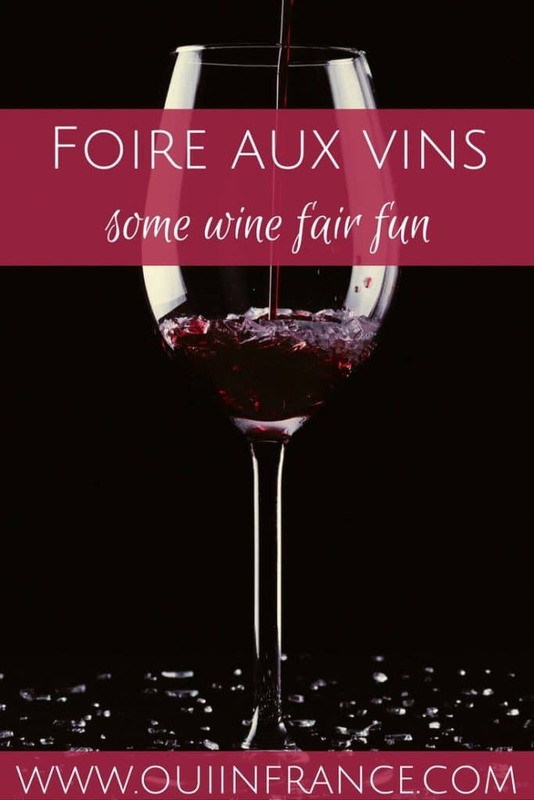 France is home to some of the best wine in the world, and if you want to save a little money while trying to sip your way around the country, the foire aux vins is where to do it! The twice yearly wine fairs in France will surely introduce you to new bottles from locales near and far. The best part is you don’t have to look much further than your French grocery store! 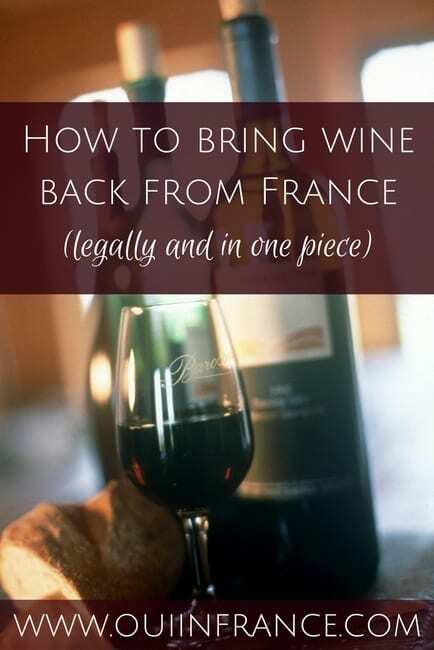 Before moving to France, wine wasn’t a weekly thing for me. I’d have a glass or two every couple of months, mostly when out to eat or at a special party. Wine isn’t cheap and when I’d treat myself at home, I’d end up pouring half the bottle down the drain anyway since I lived alone. After living in France awhile, I’ve changed my ways and have jumped on the wine bandwagon. Why the heck not have wine with dinner? My area has no shortage of fantastic (and affordable) wine producers and then let’s not forget about the grocery stores. You can find an excellent bottle of wine for under 10 euros and sometimes even considerably less than that. I happily have a glass of wine with dinner on the weekends these days. If living in France has taught me anything, it’s to be open minded about different ways of doing things. Buying wine at the grocery store for 5 euros is a normal thing to do here for many of us (whereas in the US, anything that cheap wouldn’t be drinkable). Some local Loire Valley wines are 5-7 euros/bottle and are excellent. Don’t let wine snobs tell you differently. Wine is subjective, so if you like a particular bottle, it doesn’t matter what you paid or where you got it. No judgment! Enjoy what you like! Right now, it’s foire aux vins time. The wine fair coincides perfectly with the back to school season. Coincidence? I think not. 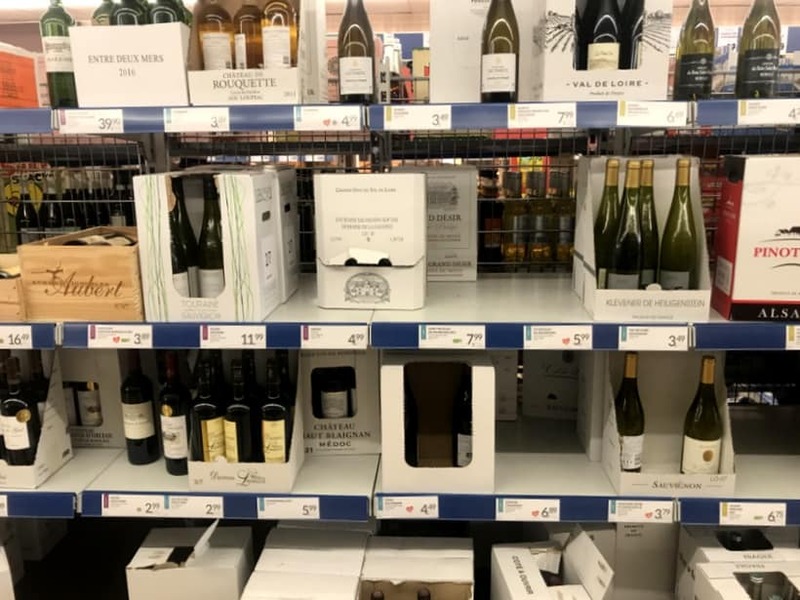 These twice yearly wine sales — the other one is in the spring — at retail outlets like grocery stores and wine shops boast some of the best bottles around ranging in price from a couple of euros all the way up to top vintages. They’re so popular that supermarkets do upwards of 20% of their annual wine sales in a few short weeks! I’m stocking up for the holidays now. Each supermarket has their own brochure with specialty offerings, but one that caught my eye was Lidl. 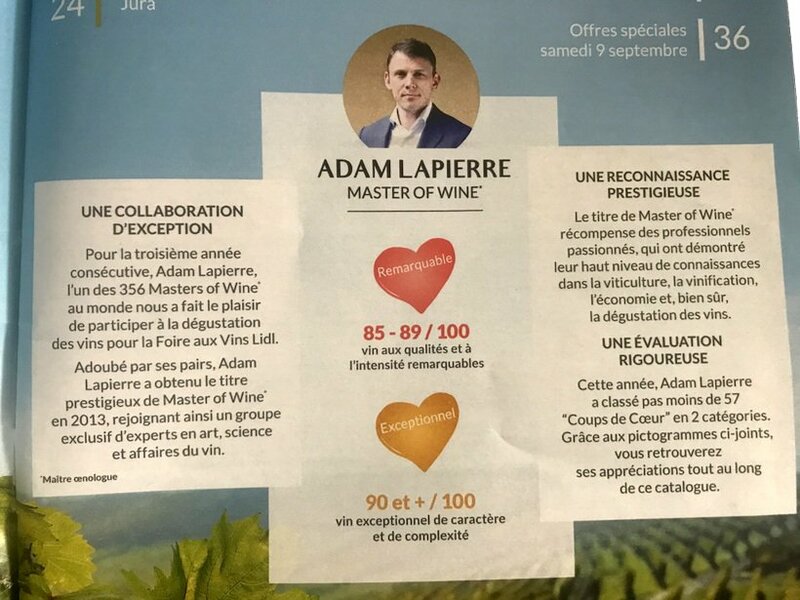 They have a “master of wine” giving his opinion on some of the best finds in addition to pairing suggestions next to each wine. It’s a really well-done brochure with many picks under 5 euros/bottle. Although the foire aux vins is a fantastic place to get a deal on wine, keep in mind that regular everyday French wine prices are a steal. So fear not if you’re in France at another time of year. You’ll find all kinds of excellent bottles for well under 10 euros — promise. One other quick note. 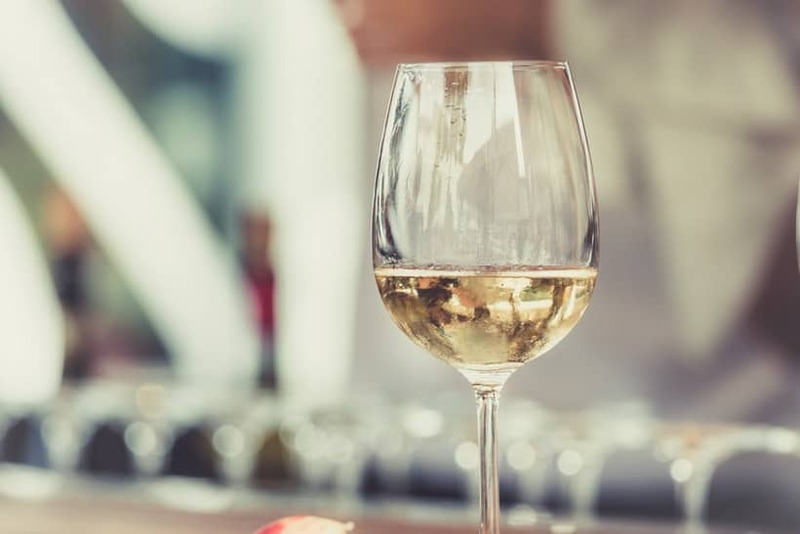 The wine fairs can also be a place where retailers try to unload less desirable wines that have been hanging around on the shelves for too long. Do your research and follow the experts’ picks. That’s why each retailer puts out a guide. But then again, what’s “less desirable” to you might be a home run for me, so have fun trying out something new. 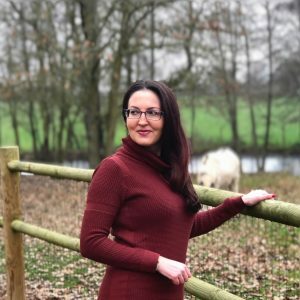 If you’re serious about the fairs, there are special wine guides like this one dedicated to educating the consumer on the best buys. Show up early on the first day. I love a good deal and will do whatever it takes to get it. If you are looking to score specific bottles, it’s best to arrive at the store on the very first day of the sale because if you wait until a couple of days later, you risk not finding the bottles you want at all. Hordes of people show up right as the stores open and the good stuff sells out right away. I learned this the hard way! When in doubt, buy 2+ bottles. If you try a particular wine and want to go back to buy more, it’ll likely be sold out by then. To avoid disappointment when you go to stock up on more, it’s best to buy at least 2 bottles of everything just in case you really like it. Trust me, it won’t be there the next time you go back to the store. Bring your own cartons. Supermarkets may be short on cardboard boxes that you’ll definitely need to transport your bottles. If you have some lying around at home, bring them with you to the foire aux vins. No one wants bottles rolling around in the back of the car! 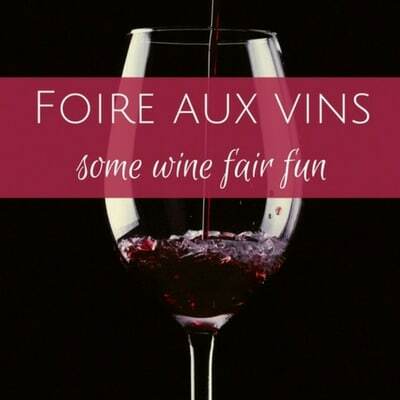 Have you experienced a foire aux vins in France? Find anything good? I feel silly asking that because OF COURSE YOU DID! We like to go to wineries directly, but (1) it’s hard to visit them all and (2) it’s considered rude to buy less than a carton of six bottles after a tasting. 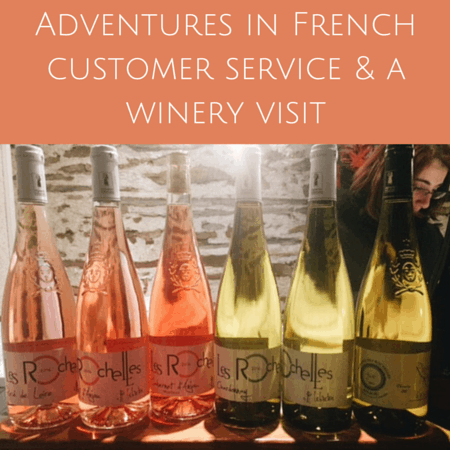 So we tend to go to wineries where we already know we want to stock up on their wine–and we usually know that thanks to the foire aux vins at the supermarket. Especially for travelers who are limited in the number of bottles they can consume and take home–they aren’t stocking their caves–the foire aux vins offers a chance to buy a nice variety. Those cardboard cartons make great packing material for bottles, too. Cut down the box, roll the bottle in the cardboard and secure with lots of tape. One box can wrap two bottles. 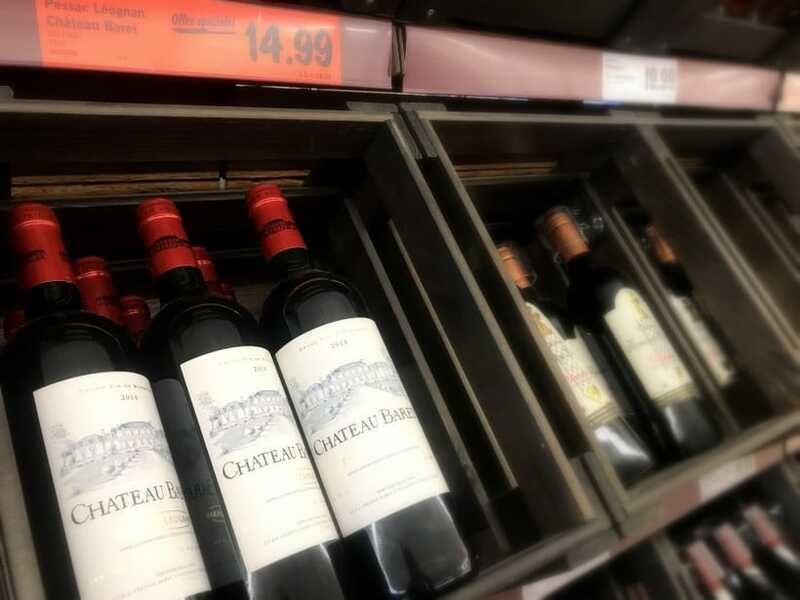 The average price the French pay for a bottle of wine is under €4. Wine that’s both good and cheap actually exists in France. I didn’t know that about it being considered rude not to buy a case of 6 bottles! I suppose it’s good that I bought a case the only time that I went. In Oregon, you pay a normal price for a tasting at most places (say $10 for 3 small pours), so since I paid for the wine, I never felt obliged to buy anything unless I really liked it. Hey Brooke! I didn’t know that either (about buying a case)! How is Oregon wine? Some is good, some is bad. I certainly find more cheap wines in France that I like than in Oregon though! I think there is still the perception in the US that cheap wine=bad wine, so no reputable winery wants to price their stuff at a low price. I’m glad that isn’t the case here! I think I always buy more than 6 bottles when I go to a tasting (so half case or more) but is it really rude to buy fewer than 12? I’ve never heard that. I know tourists like to do tastings and will often buy just a couple of bottles to consume on their trip or put in their suitcase — but definitely not a case. I love that we can get 4 euro wine!!! Thanks for reading, as always! I’ve been drinking Crémant since you recommended it and have now got my neighbours drinking it. Also love Lidl and Aldi for wine, some of theirs come highly recommended in the UK by The Times Wine Club (and Which, I believe) for a very reasonable price. 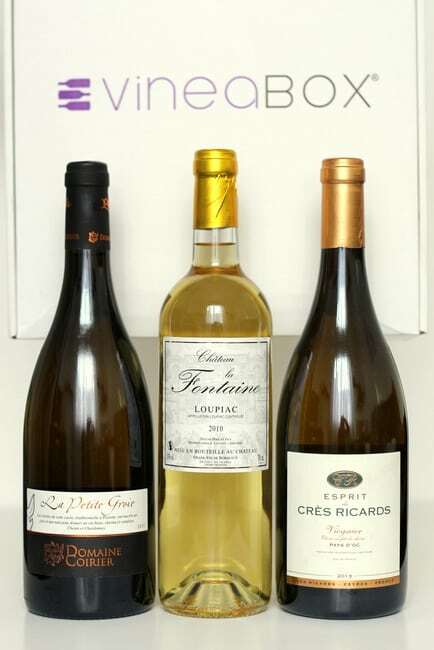 You can get a really drinkable wine in France and the UK for around the price you mention. I have even bought bottles of fizz for €3… for Kir Royales, I’m obviously no wine connoisseur but you know, it was OK. Haven’t seen the Foire aux Vins, not over in France at that time I suspect. Awww, so glad you tried my recommendation. Crémant is great, isn’t it? You’ve reminded me I need to go to Lidl today so I’ll see what bottles are left from the foire aux vins. I hope I find something good! Have a wonderful weekend! I never developed the taste for wine, beer and any other alcohol, so I came to accept it and I don’t drink… because why bother faking it? However, I always wonder if I would have worked on that if I had stayed in France. After all, I have zero incentive to discover wine in Canada. It’s expensive and you have to buy it from the LCBO so you have to think ahead (i.e. it’s not an impulse purchase while grocery shopping). Anyway, you’re way more French than I am with wine! Makes total sense, Juliette! I completely understand. Back in the US, wine tastings were a trendy thing to do but certainly something special — not the norm. So growing up in the US, my wine knowledge was limited and as I said, I’d have wine on special occasions and it wasn’t a weekly thing. Expensive too! Here, with all the local wineries and it being such a big part of French culture (and also quite cheap), my ways have changed, so we’re definitely influenced by the environment around us. Totally unrelated question, do you like the cold? Or adapted to it at least? My husband complains about the cold when it’s 40F here so I think he’d die if he had to brave a Canadian winter! Ah! 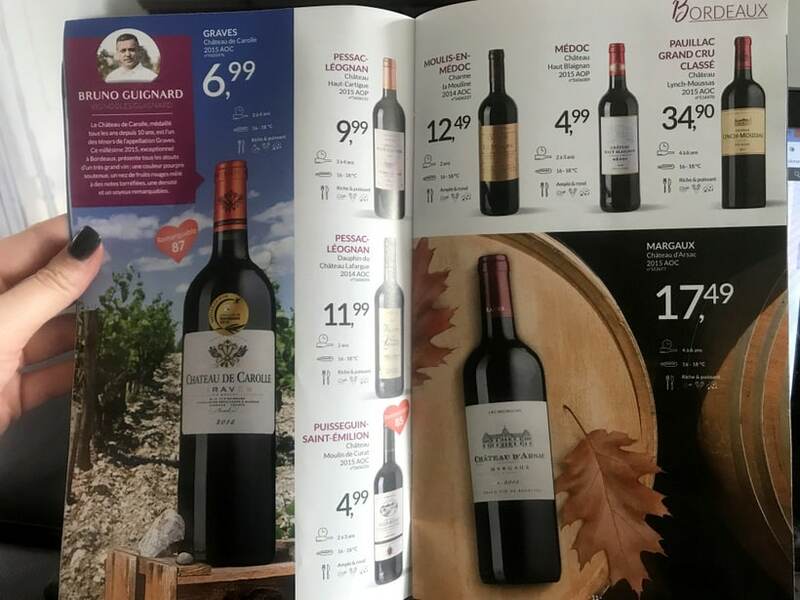 le vin à Lidl! How can this be, when at La Vinothèque de Bordeaux, near the Grand Théatre, the prices of all the grand crus are there, at least 100€ per bottles? and how the Lidl wine taste? is it good? Saint Emilion taste Saint Emilion? not really, but it is a Bordeaux, sure. The Bordeaux Supérieur is drinkable, every day wine, house wine; for Sunday Dinner something better please! The French like their wine so as Lidl is German and wants to satisfy his customers. Somewhere in an obscure place of Rheinland or Bayern, there is three big tanks with red, white and pink wine. A man in Lederhose with his wife in Dirndl are doing the thing. Filling the bottle and sticking the principal: THE ËTIQUETTES. – Hum, ça c’est du bon vin! – Guest how much I paid? Hi Daniel! I like your theory on Lidl’s wine, especially the lederhosen. LOL what an image. I would love to go to this ! I love a nice glass of wine with dinner. Sometimes, I’ll even pour myself a glass and curl-up with a good book. I drink cheap wine in the US, and I don’t have any issues. The price tag doesn’t matter to me as much as the taste does. I’ve had expensive wines that were awful, so like you said, it’s all subjective. There is a great documentary on Netflix called ‘Somm’. It’s about training to be a sommelier, and it gave me an entirely new respect for wine and wine making.